The Acquisitions Directorate has a story on the commissioning of the 17th Webber class WPC, USCGC Donald Horsley (WPC-1117). One more WPC is expected to go to San Juan, so in about six months we should see a Webber class go to Ketchikan. Certainly its improved sea keeping compared to the 110s will be appreciated. This is not, I’m sure, a complete list of future homeports, given that we expect 41 more of this class. I’m not privy to the home porting plan or how many will be in each port, but this looks like it will cover at least the next 18 months. It may cover a much longer period if more than one Webber class will be assigned to some of these ports, and that seems likely. I would note that these homeports look good from a Ports, Waterways, and Coastal Security perspective. Ketchikan and the inland passage has a lot of cruise ship traffic. San Pedro is near the huge Los Angeles port complex and the strategic ports of Long Beach and Port Hueneme. Pascagoula based ships potentially protect the ports of the Eastern Gulf of Mexico including the eastern approaches to the Mississippi River port complex and the strategic port of Gulf Port, MS. Atlantic Beach, NC is close to Cape Lookout and Cape Hatteras, but it is also close to the strategic ports of Morehead City, Sunny Point, and Wilmington. WPCs in Cape May, NJ could provide protection for Delaware Bay, including the strategic port of Philadelphia. If any of our readers has access to the homeporting plan, and it is public knowledge, I would appreciate the information. This entry was posted in Ports, PWCS, Webber Class, WPC by Chuck Hill. Bookmark the permalink. The dot on the Gulf Coast is Pascagoula, but good point about Honolulu. Are the 154ft FRC cutters considered Corvettes? So are the large cutters considered Frigates? If not, what are they considered? 378 foot Hamilton class cutters that have been transferred to other navies have generally been referred to as frigates. Huntington Ingalls, makers of the new Bertholf class, refer to them as patrol frigates in their marketing. The 20th Webber class FRC has been delivered. http://www.marinelink.com/news/bollinger-delivers-coast417195. will be second homeported in Cape May. 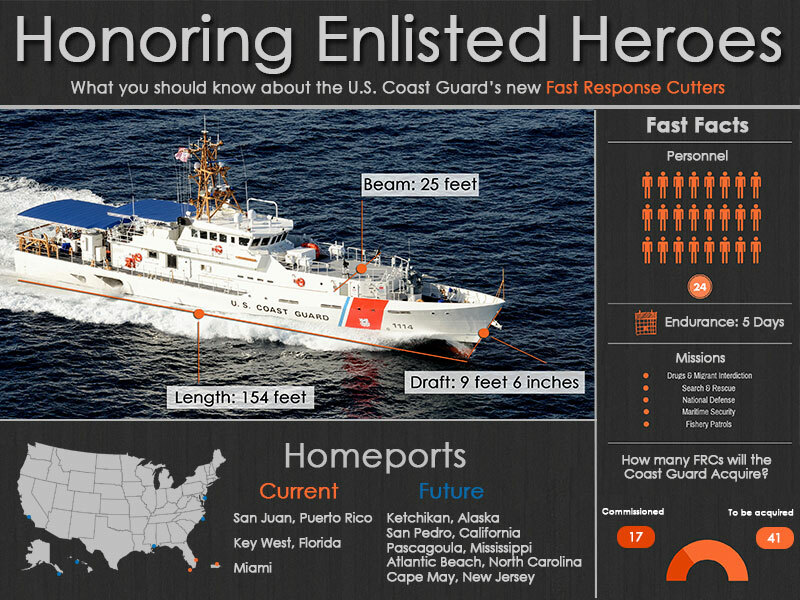 WASHINGTON — The U.S. Coast Guard announced Friday it will homeport two of the service’s new Sentinel-Class 154-foot Fast Response Cutters (FRC) in Astoria, Oregon, starting in 2021. These two ships have not yet been named, but the FRCs are named after enlisted Coast Guard personnel who distinguished themselves in the line of duty. Each of the two Astoria-based FRCs will provide the coastal maritime community with a 30 percent increase in annual operating hours on regional waters over the Coast Guard’s legacy 110-foot Island class patrol boats like the Coast Guard Cutter Orcas, homeported in Coos Bay, Oregon. The FRC is equipped with improved command and control capability as well as increased sea-keeping abilities, operational range, a larger crew and higher transit speeds than the aging110-foot patrol boats. A larger, more capable stern launch cutter boat allows the FRC to conduct search-and-rescue and interdiction operations up to 50 miles away from the cutter, which greatly extends the vessel’s reach over the Coast Guard’s legacy patrol boat fleet. The Orcas will continue to operate from its homeport in Coos Bay until its service is replaced by the first of the Astoria-based FRCs in 2021. The Coast Guard is presently examining potential homeport sites within Astoria for the two as-yet-to-be-named FRCs. It is to be homeported in Honolulu. homeport facility additions, improvements, and renovations at Galveston, TX. More evidence that the FRCs are being used more like WMECs than WPBs. From a the homeport in Cape May (Near the entrance to Deleware Bay) to Nantucket Shoal is a distance of over 381 miles. Presumably the Rollin Fritch was on patrol when it got the call. “The crew then transited more than 8,400 miles (7,300 nautical miles) to Hawaii arriving Sept. 22. Note Galveston Island was the newest of the 49 Island class WPBs. Thanks to Walter for bringing this to my attention. This marks the half way point in completion of the FRC program of record, although it is likely there will be an additional six cutters for replacement of the 110s currently used by PATFOSWA. #28 to be commissioned July 25. The Nathan Bruckenthal’s new homeport will be Atlantic Beach, North Carolina. The next four Webber class WPCs are all to be homeport in San Pedro, CA. any ideas when or if the frc will come to new England waters and where? As I get more information, I will post it here. I believe Cape May is as far North as I have seen them homeported on the Atlantic coast. I suspect the rationale may be that these ships are used much like MECs where the weather permits. New England weather being more challenging means they are going to continue to require MECs to do local fisheries enforcement. We are still only half way through the program. by the time its over we will probably have Webber class just about everywhere we had 110s. My guess is that we will see three in Woods Hole, Mass, and at least two in Portland ME. Lists the four to be homeported in San Pedro. Coast Guard Accepted 32nd Fast Response Cutter, Future Benjamin Bottoms, on Jan. 8. Second California Webber class will be commissioned Mar. 2. Benjamin Bottoms is the forth of four to be homeported in San Pedro, CA. SAN PEDRO, Calif. — The Coast Guard Cutter Terrell Horne (WPC-1131), a California-based 154-foot Fast Response Cutter (FRC), was commissioned in San Pedro, Friday. Senior Chief Petty Officer Terrell Horne III was killed by suspected drug smugglers who intentionally rammed the boat he and fellow Coast Guardsmen were aboard during law-enforcement operations near Santa Cruz Island off the Southern California coast in December 2012. Horne pushed one of his shipmates out of the way of the oncoming vessel attack and sustained fatal injuries. Each ship is designed for a crew of 24, has a range of 2,500 miles and is equipped for patrols up to five days. The FRCs are part of the Coast Guard’s overall fleet modernization initiative. FRCs are named in honor of Coast Guard enlisted leaders, trailblazers and heroes. Looking at Wikipedia, https://en.wikipedia.org/wiki/Sentinel-class_cutter#Ships, it appears three will go to Galveston (WPC-1136, 1137, and 1138). WPC-1134 will make the third FRC in Honolulu. WPC-1135 will make the third FRC in Cape May. WPC-1139 will make the 7th FRC in Key West and the 20th in D7.